Hayfever is an inflammatory condition in allergic response to pollen.It affects the mucous membranes of the eyes, nose, throat, palate and sinuses. Symptoms may include: itching of the eyes, nose, palate and throat and either a blocked or runny nose accompanied sometimes by watery eyes. Wheezing or breathlessness can also be experienced. 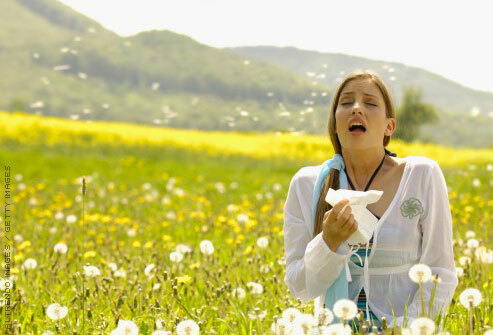 Hayfever is seasonal and occurs in Spring (mostly tree pollens) and Summer (mostly grass pollens). Pollen can be blown by wind over long distances and strangely it is not uncommon for sufferers to be worse in large cities. This is because the inflammatory response can be made worse by dust, animals and other atmospheric pollutants (such as exhaust fumes). It is often more correctly referred to as Seasonal Allergic Rhinitis. So Why do the Symptoms of Hayfever occur? The plant pollen is recognized by the body as a foreign particle and so the immune systems responds like it would to an invading virus and produces antibodies. The protein immunoglobulin (or IgE) and the pollen come into contact with the surface of special cells called Mast cells. These are then triggered to burst and release histamine and other chemicals into the surrounding tissues, producing the inflammatory response. So what homeopathic medicines can help you? Homeopaths treat hayfever sufferers in two ways. They can prescribe a medicine to deal with the acute symptoms; and they can also treat the individual in a constitutional way before the hayfever season starts to prevent the hayfever response. In addition they can give the homeopathic medicine prepared from the pollen that causes the allergic rhinitis response, and effectively de-sensitize the individual. This is called Isopathy. If you are are a hayfever sufferer now is the time to pay your local homeopath a visit before your symptoms make your life miserable. If you would like to treat yourself or your family for their acute hayfever symptoms then read my article in the next issue which will describe the effective medicines for treating the acute symptoms of hayfever and how you use them.